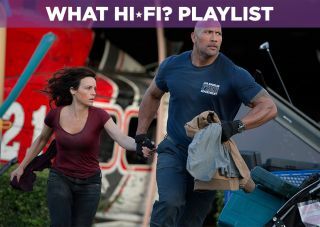 San Andreas – film review | What Hi-Fi? Rock, paper, earthquake. Dwayne Johnson leads in the line in this latest disaster film. Scenes of mass destruction? Check. Famous landmarks destroyed? Check. People running for their lives? Check. Family in peril? Check. San Andreas is what we've come to expect from a disaster film. It ticks most of the boxes, but struggles mightily hard with one in particular: originality. It's all a bit predictable. Paul Giamatti's Lawrence, a Caltech scientist (and serving as the film's Basil Exposition) comes up with an early detection program that can predict earthquakes. During a test run at the Hoover Dam he and another scientist, Dr. Kim Park (Will Yun Lee), come across sizeable tremors that indicate a massive earthquake is coming, but before they can warn others the earthquake hits destroying the dam in the process. But it's not the end. As the tectonic plates that make up the San Andreas fault shift it sets off a series of earthquakes that devastates California, endangering everyone from Los Angeles to San Francisco. Caught in the midst of all this is Dwayne Johnson's Ray, a helicopter rescue pilot on the verge of divorcing his wife Emma (Carla Gugino). He struggles to come to terms with the separation, remembering when he, Emma and their daughter Blake (Alexandria Daddario) were a family - but a tragic accident pushed him away, leaving architect Daniel Riddick (Ioan Gruffudd) to swoop in. As California rumbles he races across the state to save both his estranged wife and daughter. The biggest problem with San Andreas is the familiarity of the story and characters. Carlton Cuse's script coasts along, hitting every emotional beat in a workmanlike and efficient way that nevertheless can't rise above the clichés and tropes of the genre. That familiarity has a stifling effect, meaning the action sequences – which are on a huge scale – lack a sense of danger, tension and ultimately genuine thrills. Despite placing its characters in mortal peril several times, the film is too safe really to cause any flutters of the heart. We've seen these relationships covered in both better and worse films, and there's little in Andreas that distinguishes itself from what's come before. That's the most disappointing aspect about it: at times San Andreas is distinctly unremarkable. There are satisfactory moments among the more banal scenes. From a technical standpoint the movie is outstanding, the visual effects consistently delivering the scale that warrants a viewing on the big screen; buildings topple and collapse in plumes of smoke, a tsunami wrecks the San Francisco Bay area and, in the time-honoured tradition of the disaster film, each threat to the characters is bigger than the last - and the effects are more than a match for them. It's also loud. When a building falls, expect to feel the rumble of the soundtrack pulsing through your seat. We saw it in 3D, and while it was decent at the beginning, by the film's mid-point we forgot it was even there. A good or a bad thing? We're not sure. Director Brad Peyton (Journey 2: The Mysterious Island - don't bother) doesn't revel in the destruction. This is a film that hearkens back to ’70s disaster epics such as The Towering Inferno and The Poseidon Adventure, and like those films it wears its heart on its sleeve. Where Roland Emmerich's 2012 considered itself more of a joke (and audiences agreed), Andreas is relatively more mature and earnest. The (epi)centre is the human characters and their relationships, and the film recognises their plight even if it does come across in a hackneyed way. Ray and Emma - estranged from the start - find themseves drifting back towards each other. It's predictable, but both actors commit to their roles. Johnson is fine as Ray, dialling down the charisma that made his Luke Hobbs character in The Fast and Furious films so fun (and ridiculous). He's solid and dependable, as are Gugino and Daddario, the film serving up two capable female characters that rescue the men as much as the men return the favour. They're decent ,but none of the cast can liven up the dialogue or the plot to make their roles stand out. There's also one baffling cameo in the film that we won't spoil, but you might raise your eyebrows if you notice it. Ultimately, San Andreas is a story of heroism in face of overwhelming adversity. There's nothing here you haven't seen before. Andreas isn't awful or mediocre – it's watchable – we just wish it was fresher. The visual effects are outstanding and the cast is likeable, but it's on shakier ground when it comes to story and characters, not doing enough to separate itself from the herd of identikit disaster films. The Rock beats earthquake? Not quite.